Must have for coffee lovers. You'll learn more about the world of coffee from Mark Prince's CoffeeGeek podcast than the next ten best sources combined. Be advised though this is a full-featured and wide-ranging podcast covering many aspects of the coffee world, not just the product itself. You'll learn where it comes from, who grows it, how it gets to your cafe, how to brew it properly (and improperly), plus you'll hear about and often times meet some of the people who help shape the world of speciality coffee from baristas competing in competitions to cafe owners and microroasters. Listen to the first shows so you can establish the foundation that Mark bases his coffee philosophies and practices upon. It's a shame some people don't understand professional quality when they hear it and give this excellent podcast a poor review. This guy is top notch, a leader and authority in his field. Great info for everyone from beginners to pro "third wave" baristas! When you're at work and can't get any coffee, escape to Vancouver. Working in a restaurant this show has provided me with an education about coffee that is valuable. Their website is also amazing. Great Job. Mark and Hugh have passion and knowledge about coffee. The show has definitely hit its stride. I loved the emailed answered show. Really has opened my eyes to the world of coffee. Who Doesn't Love A Geek? Outstanding Podcast. Mark sounds like a cool person. It's a well rounded and entertaining podcast. I love exploring and trying different styles of coffee. The hosts are truly passionate about coffee and it shows in each podcast. A must for the home brewer. As a coffee lover this show offers great information about different types of coffee. The content is top notch. I really dig this show. A quality podcast. I'm need more. This is my favorite Cup. Mark is a great host. I like the content. This is a keeper. I like the informative nature of this podcast. Lot's of really good information on the world of coffee. This is a great coffee podcast, if you are interested enough in coffee to listen for the full duration. The only negative thing I can say is that you never know when the next podcast is coming. Good Production, Great Content. Looking forward to future shows. There's a ton of good info in this podcast, but the host's personality can be grating. There are a lot of inside jokes, self-indulgent prattle, and ego stroking. That being said, it's still one of the better coffee podcasts around. I think the host could probably use some help editing this show. Most episodes would be better if they were about 2/3s the length and more to the point. Way too much inside jokes. Not informative. This show started out great but has deteriorated to a asecond rate program wherein the host uses the podcast to advance himself in the world coffee organizations. Talks a lot about organizations and structure and occasionaly brings on his annoying girlfriend who is a distraction. He says the show is about coffee and not the "buzz". It is all about the buzz of this "climber" using the method of a podcast to promote himself. It is supposed to be biwwekly but is mostly whenever the host gets a whim to do a show and there is someone available to help him along in the "coffee world". Would someone start a podcast just about coffee? Say 'NO' to bad coffee! I'm a coffee newbie and still found Mark Prince's podcast to be informative. I've found out that most lattes at Starbucks really have improperly made espresso shots and badly foamed milk. Ever since I started to listen to this podcast, I bought a Bialetti Moka Pot and a Melitta Perfect Brew. I discovered a nice cafe in my area which serves microroasted coffee and makes wonderful espresso. Now Starbucks and other chain store lattes and espresso machiattos taste like sour and soapy milk! Please listen to this podcast to graduate from instant coffee! I've now dropped $100-ish on a burr grinder (low-end, but it's better than the blade grinder I had) and another $80-ish on an espresso machine (ditto, and the stove top pot wasn't cutting it anymore). I buy fresh coffee from a local roaster. I stopped drinking lattes after 10am. 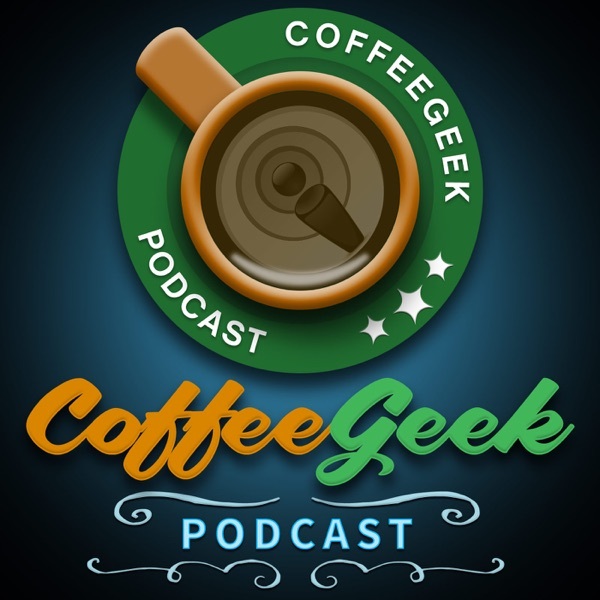 I wait eagerly for the next episode of the CoffeeGeek Podcast. Augh!!!!! "You can brew it...we can help"
This could be the secondary motto. Always great information from inside the industry. I look forward to each new episode. Thank you Mark Prince and team! Keep up the good work. Covers a wide area of coffee information and really makes you feel like your apart of a bigger society of people. Coffeegeeks Rule! Love it. Always covers every angle of the coffee industry from roasting to coffee marketplace news. Enjoy the web site, and love the podcast when I am on the go. a great podcast for expanding knowledge of the coffee world without ostracizing the common coffee drinker by having to much coffee industry "groupie" talk. it's about the quality of the coffee! !